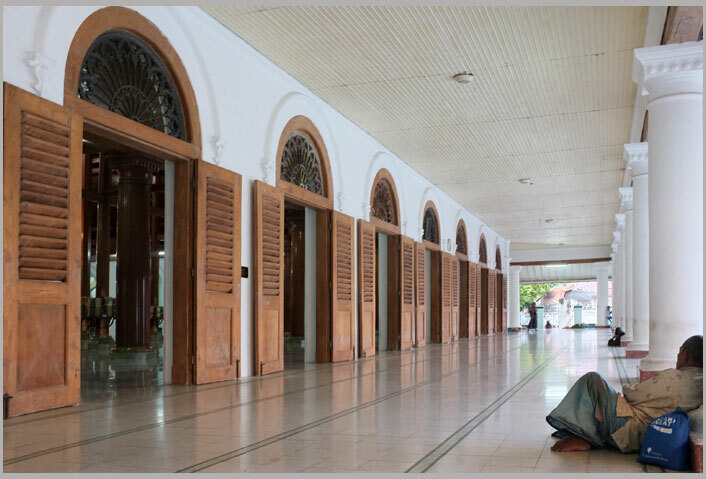 In Surabaya, the capital of East Java Province, there is an old mosque located within an old quarter mostly inhabited by Arabic descendants from Hadhramaut (South Yemen). For centuries, the Arabs dwelled around the mosque built by Sunan Ampel (one of the Wali Songo – nine Muslim saints spreading the teaching of Islam in Java) in the fifteenth century. 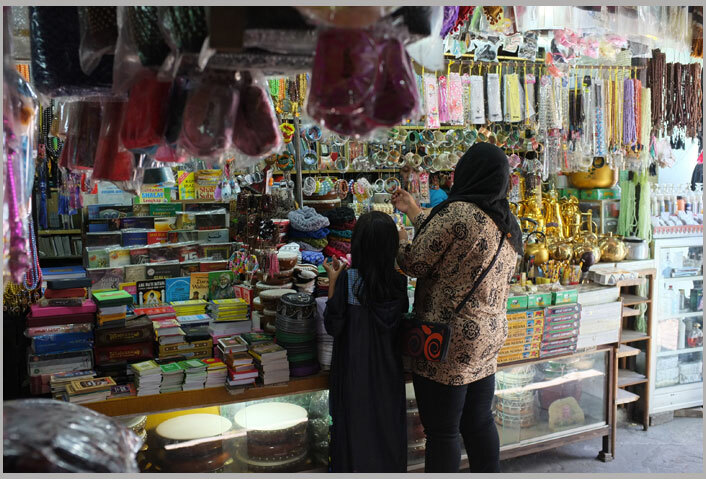 The Arabs run shops, restaurants, and other kinds of business, and become well assimilated with local culture and dialect. 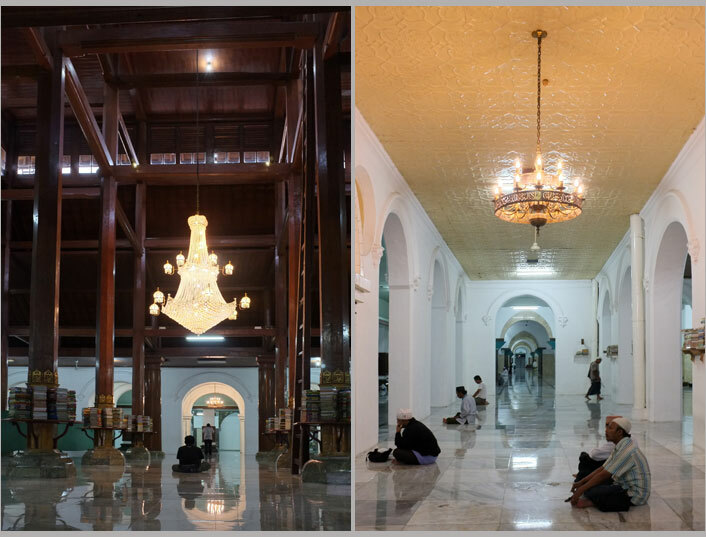 The old mosque becomes well known as Masjid Agung Sunan Ampel or The Grand Mosque of Sunan Ampel and as for the old quarter, it is today known as Kawasan Ampel, after the saint. Last month, I took a few days off from the office to visit the old mosque in that quarter. Instead of finding Arabs in the mosque, I found many people coming from outside Surabaya. Many of them came in groups, intended to visit the old cemetery located in the backyard of the mosque. People were rushing for dusk prayer. Like a city that never sleeps, the area surrounding the old mosque remains vibrant even when the sun has set. 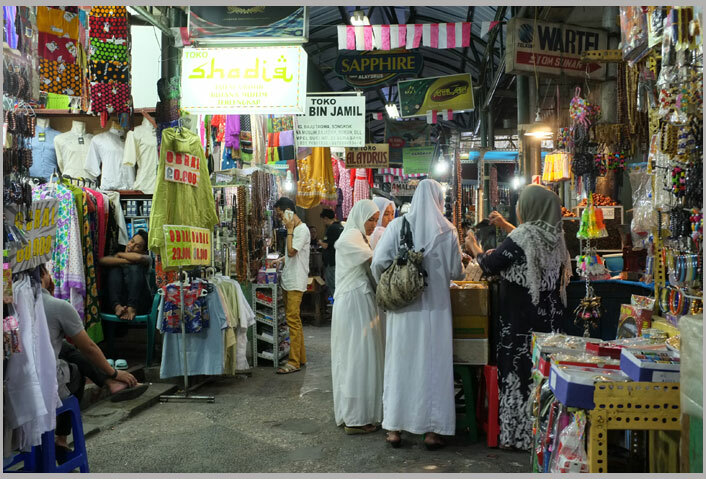 With shops on both sides, the narrow street toward the mosque has become a magnet that attracts people to come. All old mosques I have seen in Indonesia have cemeteries in their backyards. I guess it was something common in the past to burry the dead close to the worship houses. What’s interesting to me is the fact that many of those cemeteries are sacred and become new places of worship. Although, in some old mosques, people are strictly told not to ask any favor from the dead, they keep coming to pray in front of the tombs. It teaches me a lesson that Islam in Indonesia, - no matter how long it has been since the Wali Songo spread it in Java centuries ago, - is still intertwined with ancient beliefs, rooted to the Hindu tradition. A man was deeply immersed in his prayer right in front of the tomb of Mbah Bolong, a nickname for Mbah Sonhaji, one of Sunan Ampel’s students. Sonhaji was believed to be a helmsman sailing from Hadhramaut to Java in the fifteenth century. In helping Sunan Ampel to build the mosque, he was in charge of determining the direction to Mecca. Legend has it. He dug a hole on the wall of the mosque to let people see ka’ba in Mecca through it. He was then nicknamed “bolong,” – Indonesian word for hole. A small cemetery bordered with iron fence in the north side of the mosque.There lay the remain of KH Mas Mansyur, the national heroic figure dated back to the early 20th century when the concept of nationalism began to rise in the former Dutch East Indies. The tombs were scattered, so it was not easy to find which one of his. In 1974, an airplane brought Indonesian hajj pilgrims from Surabaya to Mecca crashed in the mountainous region of Maskeliya, Sri Lanka. Nearly all of their bodies were buried in a mass grave in Sri Lanka. Only small numbers of them were returned to Surabaya and buried in the backyard of Masjid Agung Sunan Ampel. All the tombs here were anonymous. Of all the tombs, the one of Sunan Ampel is the most sacred and becomes the magnet attracting hundreds of people everyday. To reach the tomb, one has to take off their shoes or sandals, walk through a Hindu style gateway, and sit under a huge old tree. It was too bad however that taking picture of the saint’s tomb was not allowed. So I just watched from a distant people spent minutes to pray in front of it. 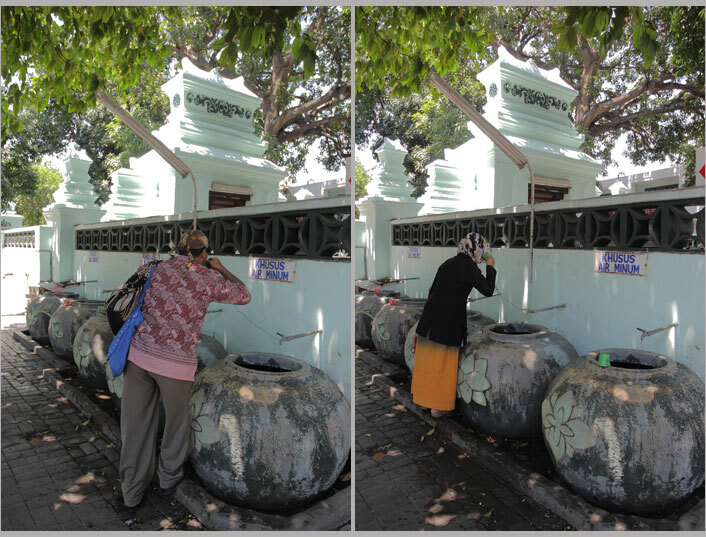 I was of course curious to find why would these people came all the way to Surabaya, just to pray in front of these old tombs around the old mosque. To my sense, everyone could pray from everywhere in every corner of the world. To Ibu Sri, a woman I met at the cemetery, the case was not as practical as that. “I have been here for like a month,” said Ibu Sri who came from Malang, a city 90 kilometers away from Surabaya. “This place is sacred because the people buried here had some kind of charm or gift when they were still alive,” she continued. “I believe that their charms remain here,” she added. For Ibu Sri and perhaps other visitors, saying prayers in such a sacred place would be more convincing than in any other places. All because of the charm! A Hindu style gateway where people had to walk through to reach the tombs of Sunan Ampel, one of Wali Songo, the nine Muslim saints who spread the teaching of Islam in Java around fifteenth century. Shaded under the tree, these people came in group to read the holy Quran in front of nine sacred tombs of Mbah Soleh. It was not sensible of course for one dead man to have nine tombs named after him. But that’s what I found here. During his life, Mbah Soleh was one of Sunan Ampel’s students who worked as the caretaker of the mosque. He was in charge of cleaning the mosque, and was able to sweep the floor and make it spotless. When he passed away, no one was able to feel his shoes in making the floor spotless. It became dirty and concerned Sunan Ampel. The saint then wished his student had been still alive just to clean the mosque and make the floor spotless. His wish then resurrected Mbah Soleh to live again and do his daily chores. It happened over and over again as much as nine times until the saint himself passed away. I was definitely not sure about this story, but I had no intentions to do a research to find out why there were nine different tombs for this one dead man. The most noticeable grave to my eyes was of Njai Roro Kiendjeng. It was most likely that the grave was made during the late colonial time since the inscription was written in Dutch, with beautiful Art Nouveau font. Born in 1739, Njai Roro Kiendjeng was the daughter of Kyai Tumenggung Onggojoyo, the former regent of Pasuruan, East Java. She played a very significant role in the history of overseas Chinese people in East Java as she was married to Tjoa Kwie Soe, the very first Tjoa clan coming to that region. From that inter-racial marriage, perhaps inter-religion too, she gave births to six children who became the early generation of Tjoa family in East Java. That’s why in the inscription she was written as a stammoeder or an ancestress. When she passed away in 1793 at the age of 54, I am pretty sure that her early tomb didn’t look like it is today. Art Nouveau font hadn’t even been invented yet that time. The only question I have in mind is why she was buried at the backyard of this grand mosque. In some old mosques, water becomes another sacred thing beside the cemetery. At The Grand Mosque of Sunan Ampel, I saw people, without no doubt, not even think about hygiene, took water from jars made of clay with a plastic cup and drank it right away. As for the plastic cup, it was tied to the faucet. So everyone drank from the same cup. Oh, for God’s sake, could they at least bring their own cup? They didn’t just drink it, they also washed their faces with the water. It seemed to me that for these people, the sacred water could purify and had the power to heal. Five jars made of clay are placed in a line, containing water from the ground. Each jar comes with different motives of flower. People come to drink the unboiled water with a plastic cup tied to the faucet. The water is believed to have the same savor with the zam zam water in Meca. As if to baptize the baby, these two women showered the infant with the water taken from the jar. Despite the fact that there was no such thing in the teaching of Islam, people felt more convinced with anything sacred. 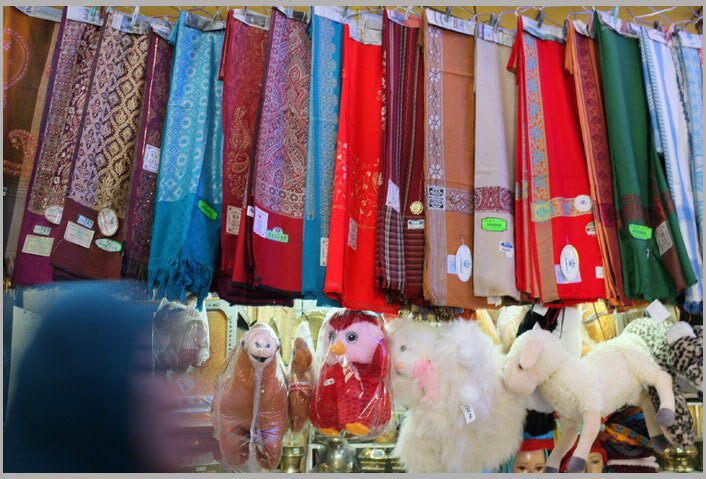 Another common thing I found in many old mosques was the traditional marketplace. Many mosques in the past played role as community centers where people gathered everyday, not just for praying, but also for studying and other communal activities. It would be sensible if they built such a commercial place like a market close to the mosque. Walking to the south direction from the mosque, through another Hindu style gateway, I found a long corridor, topped with translucent roof, bisecting shops selling perfumes, prayer bids, Islamic books, dates, Muslim cloths, and other stuffs that brought my mind to typical Middle East market that I had seen in movies. 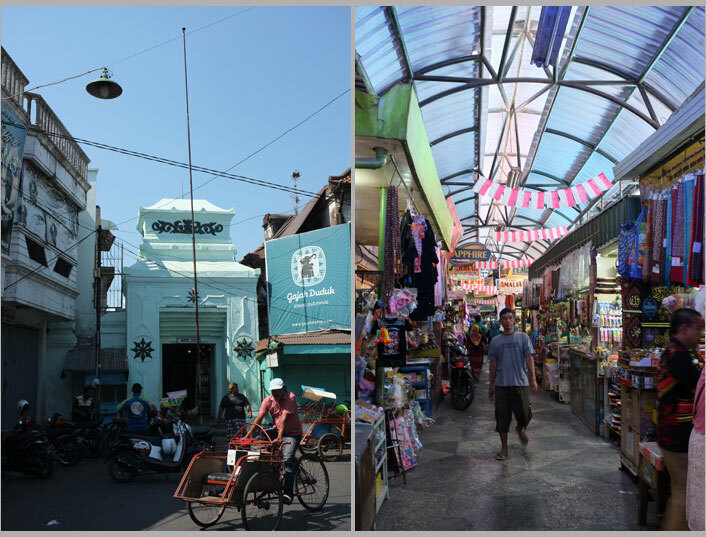 I was not sure how old this marketplace was, but looking at old pictures of Ampel, this corridor, together with the two Hindu style gateways at both tips had already been there since a long time ago. The marketplace along the corridor to the mosque might look like the ones in the Middle East, but both its ends were adorned with Hindu style gateways. No such thing as fixed price. Everything sold in the marketplace near the mosque comes with negotiable price. Let’s take a closer look to the old mosque. It was said to be built in 1421. Sunan Ampel, the saint, was assisted by his close friends who were also his loyal students; Mbah Soleh and Mbah Sonhaji, both were also buried at the same cemetery around the mosque. It wasn’t easy to see the antiquity of the architecture from outside. It had already been mixed up with the new structures. I guessed they had renovated the mosque a bit too much. But as I entered the mosque, I could see clearly the sixteen old solid wood columns that supported the roof. Those round columns stood seventeen meters high, each had diameter of sixty centimeters, and were the only structures remained from the early stage of the construction. I was pleasantly shocked and couldn’t stop wondering how the people in the fifteenth century carried sixteen solid teak woods to the site and what kind of technology they used to erect those woods. I could just ask the caretaker or anyone there who might understand the history there, but I was too afraid if they would give me irrational answers. So I kept those questions in my head, hoping to find the answer one day. 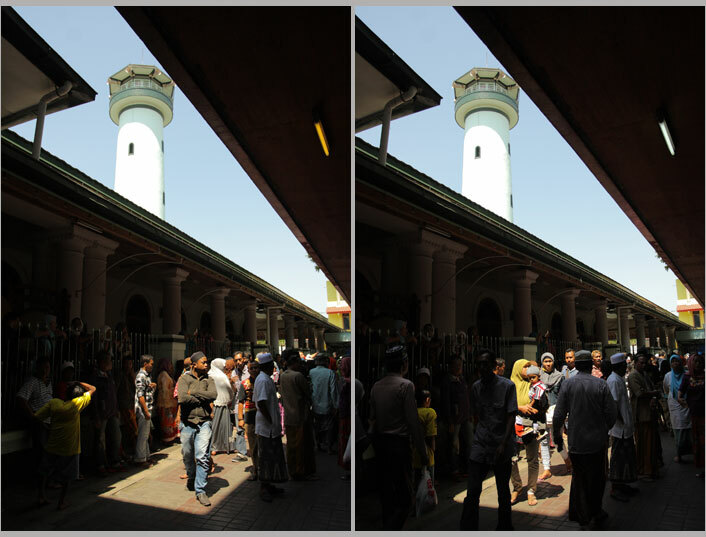 To reach the tomb of Sunan Ampel, people have to walk around the south side of the mosque through narrow corridors. 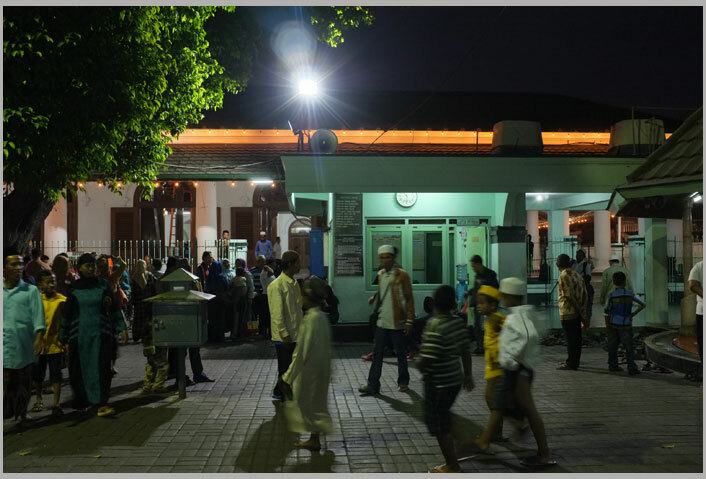 At dark, people still come to see the sacred tomb of Sunan Ampel. Right after the dusk prayer, I walked to leave the old mosque for the hotel. Along the narrow street toward the main road, I passed lots of people who kept coming to the mosque. They came for different intentions. For whatever those were, I was fascinated that this mosque was so vibrant it never slept all day long. Perhaps Ibu Sri was right, the charm of those people from the past still worked.